In 4-quart Dutch oven, mix uncooked pasta and sauce mix (from Hamburger Helper box) and water. Heat to boiling. Reduce heat to medium; cover and cook about 15 minutes, stirring occasionally, until pasta is tender. 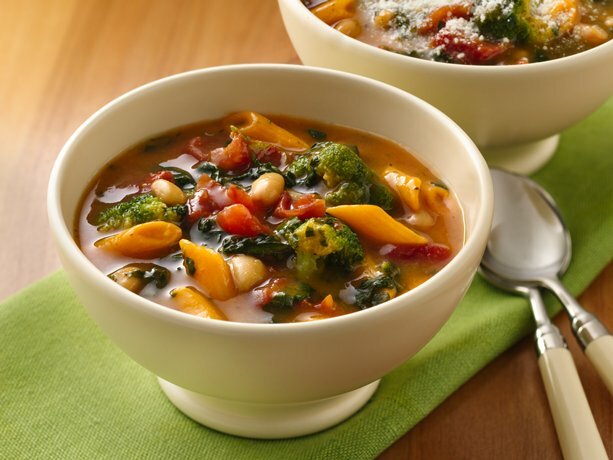 Stir in broccoli, spinach, beans and tomatoes. Cook 5 minutes longer, stirring occasionally, until vegetables are thoroughly heated. To serve, sprinkle each serving with 1 tablespoon cheese.